Along with being musical director of the original "Alvin and The Chipmunks" TV series, he sang the voice of "Theodore". He has worked over the years with George Gobel, Johnny Mathis, Nat King Cole, Dean Martin, Frank Sinatra, Julie London, Steve Allen, and was Danny Kaye's conductor on a twelve week tour. With limitless energy and enthusiasm, Mann sincerely espouses the positive and good of America through his entertainment. 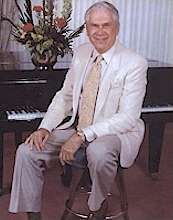 He was invited to perform at The White House twice during President Nixon's administration to entertain Imelda Marcos and first-time Russian visitor to the U.S., Leonid Breschnev, General Secretary of The U.S.S.R.
Mann's devotion to his country has made him the recipient of four consecutive awards from The Freedoms Foundation at Valley Forge, top awards from The Disabled American Veterans, The Medal of Honor from The National DAR, The Silver Helmet Award from the AM VETS, The National Honor Medal from The Veterans of Foreign Wars, and numerous citations from The American Legion. Mann has appeared twice as Guest Conductor of the world famous United States Air Force Band and Singing Sergeants in Constitution Hall, Washington, D.C.
Johnny has composed, arranged and produced hundreds of radio and TV product commercials, and is well-known for his original radio station I.D. Jingle Packages such as 93 KHJ "Boss Radio," KFWB Channel 98, K-EARTH 101 (KRTH) in Los Angeles, and a multitude of other stations in cities around the United States, as well as Canada, Taiwan, Honolulu, Hamburg, Germany, and Australia. He created and produced jingles for The ABC Radio Network and the 145 affiliated "Oldies" format stations. Active in many charities, Mann has hosted eight celebrity golf tournaments. He resides in Anderson, SC with his wife, Betty. In 2000, he produced a CD for The National Senior Olympics Games, "Let The Games Begin." and in 2008, he composed his latest patriotic song entitled, "One Nation Under God" which led to the new CD by the same name, a compilation of well-known patriotic songs along with four original titles. On June 18, 2014, Johnny Mann peacefully passed away at his home in Anderson, South Carolina.